Australia’s infamously dangerous arachnids have revealed a more benign side, with their deadly venom harbouring the potential to block sodium channels involved in pain, epilepsy, and stroke. The University of Queensland’s Professor Glenn King is the first to admit his fascination with venom came by chance. A collaborator asked him to analyze a toxin found in the venom of Australia’s deadly funnel-web spider. The work led to clues about the toxin’s function, a paper in Nature Structural and Molecular Biology, and eventually a change in King’s research focus from cancer to venom. King would eventually discover that funnel-web venom has more than 3,000 components, making it “probably the most complex chemical arsenal in the natural world”. The research has already yielded an insecticide derived from funnel-web spider venom that is now marketed in the US by Vestaron Corporation, a spin-off company King founded while working at the University of Connecticut. 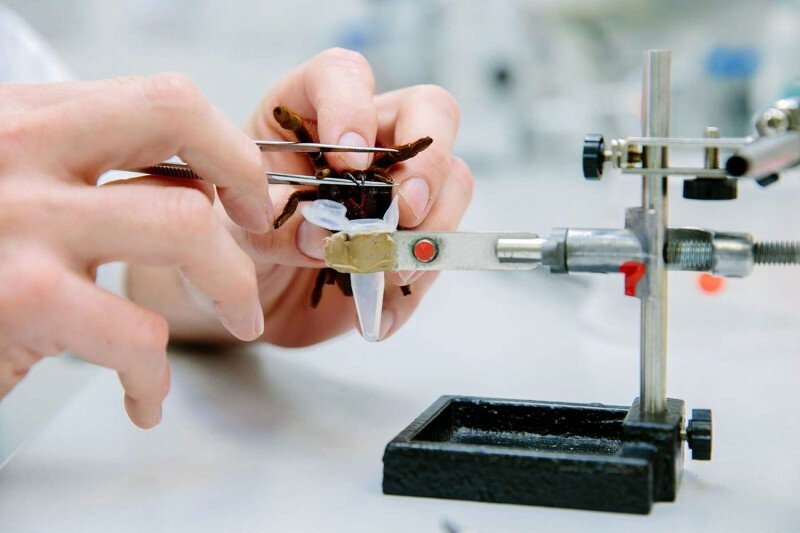 His work has not stopped with bug spray; King’s lab at The University of Queensland contains the most extensive collection of venoms in the world, with samples from more than 600 species of spiders, scorpions, centipedes, and assassin bugs. Like other venomous animals investigated by his team, funnel-web spider venom contains small proteins or peptides that interact with, and modulate the activity of, ion channels and receptors in mammalian neurons. That discovery led King and his team to focus on ion channels involved in human disorders such as epilepsy, pain, and stroke. “We know these venoms are full of ion channel modulators, so we thought maybe we could use them as libraries to screen against ion channel drug targets that we know about,” he says. The approach has had phenomenal success, with King’s laboratory uncovering possible therapies for Dravet syndrome, epilepsy, abdominal pain, and stroke. Dravet syndrome is a rare and life-threatening form of epilepsy that strikes children in the first year of life. It is caused by a mutation that reduces the amount of NaV1.1, a key sodium channel in the brain that is critical for regulating brain excitability. 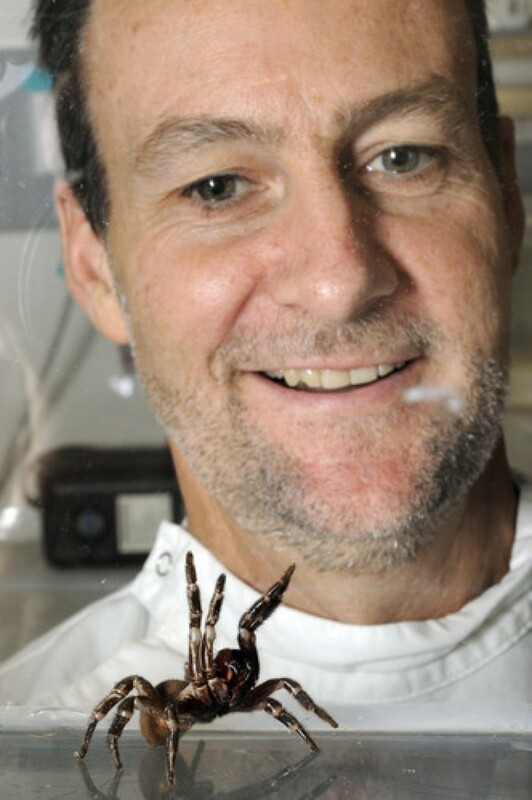 Working in collaboration with Steven Petrou at the Florey Institute of Neuroscience and Mental Health, King’s team found a peptide in funnel-web spider venom that restores normal function of this channel and eliminates seizures. Funnel-web spider venom has also proven to be the key ingredient in his work on strokes. During a stroke, acid-sensing ion channel 1a is activated and this sets off a death spiral for neurons. King’s team has found a funnel-web spider venom peptide that binds to this channel and stops it from becoming activated during stroke. With two million neurons dying every minute without treatment, time is of the essence during a stroke. However, as King points out, there are two kinds of stroke. “We have only one drug available for ischemic stroke, but it can make things worse for haemorrhagic stroke, so you can’t give the drug until you get the patient to hospital and image the brain. King does not have a favourite source of venom, but he does have a soft spot for the Australian funnel-web spider, which has repeatedly shown potential as a supplier of eco-friendly insecticides and human therapeutics. Australian wildlife’s venomous reputation may one day prove to be an unexpected lifesaver.